Beginning with God helps parents with young children to explore the Bible with their child. This book provides a simple way to start your child in a regular habit of reading God's Word and growing to know God, who loves them. We hope this book will help you and your child to explore the Bible together. Along the way you will meet King David; read about God’s special messengers to his people in the Old Testament; and be thrilled by the wonderful things said and done by God’s perfect Son, Jesus. But most of all, we hope that reading God's special book, the Bible, will help your child to know God, who loves them. In today's culture so much pressure is put on us to feed our children well. We pray that this material will help those of us with pre-schoolers to nourish them with the word of God. The main course: read today's true story from the Bible; answer some simple questions; pray together; then stick in today's colorful picture of the story. Appetizer: an optional activity to grab your child's attention before the story. A snack for the journey: a conversation to have while out and about. Make it and munch it: optional craft activities to help your child remember today's true story. Colorful sticker set included with book. 6" x 8.8" x 0.3"
'Beginning with God: Book 3' is excellent! We have been using it with our 3 year old and he thoroughly enjoys it. He loves to do the introductory task, answer the questions on the passage, put his hands up in the air with excitement about what we've learned about God (and say 'wow' very loudly!) and of course, put the sticker up on the wall to map out our Bible overview. Thank you GBC! Our 2 year old daughter loves using it with her Bible. We have been doing these beginning with God books with our 4 and 6 year old and they are fantastic! Good clear simple questions with a good introduction to get them interested. The questions and prayers get to the heart of the passage. Tremendously helpful! Hard to find bible studies for pre-schoolers, especially ones which tell the bible as it is, so we really enjoyed this! Fab stickers, colourful, and relevant. Hurray for another Bible study sticker book! We have found all three books hugely helpful in varying the format of Bible story time from time to time. We have just finished book 3 with our 3.5 year old and 18 month old. The former was thoroughly engaged and even the latter loved doing the stickers! The activities are brilliantly thought-out and the questions provide a great structure for ensuring the passage has been understood and applied. We can't wait for book 4.....! 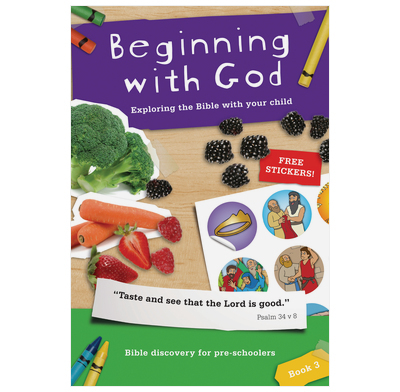 We have thoroughly enjoyed using Beginning with God books 1 and 2 with our 31/2 year old, and were looking forward to book 3. It is good, but the questions are sometimes a bit difficult for this age. In the previous books, the summary sentance about the story was usually enough to give most of the answers to the questions, whereas that is not always the case with this book. Also, some summaries include 2 or 3 points, whereas they would be better with just one simple truth, and on occasion, extraneous points come through in the prayers (eg. Daniel and the lions - teaches 'Daniel only prayed to God and that God kept Daniel safe', yet the personal prayer is 'Help me to keep your rules which are always good'). However, I would recommend getting it - just be thoughtful as to what your child can manage to take in and perhaps alter the teaching point or prayer if need be.